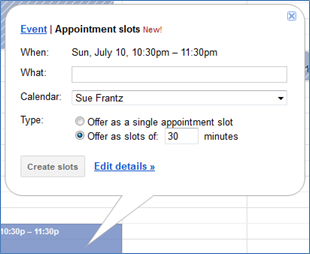 In addition to adding an event, you can also create appointment slots in your google Calendar. You begin by clicking on the calendar and instead of continuing with event, select appointment slots. Appointment Slots allow others to select 30 minute slots that will then be added to your calendar. Why would one want to do this. One scenario that comes to mind is Parent Teacher Conferences. You could set up appointment slots for a Tuesday and Thursday evening from 4:00-8:00 PM. You could set those slots for 30 minutes each. As you complete your appointment slots you will be given a link which includes your appointment slots embedded on a page. You can then send this link to parents who can sign up for a slot. The appointment is added to both the parent's and your calendar. A word of caution is a Gmail account is needed for this to work. The easiest solution would be the parent creating their own Gmail account. This makes a lot of sense if their students are in a GAFE school. Another option is creating the appointment through their child's Gmail account.